TEMPLE NIGHTSIDE's highly anticipated second album, The Hecatomb. For the last five years, mainman IV has been pursuing a bleak 'n' oblique vision of death metal. 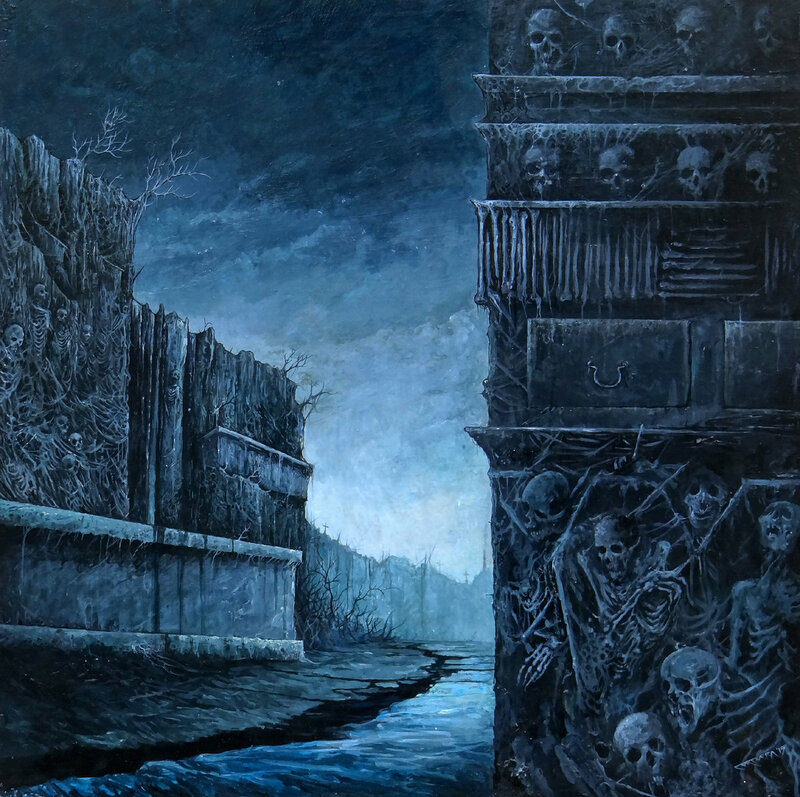 Although rooted in the vast and vibrant Australian black metal scene, the mysterious IV invested the blackest of arts into ancient Metal of Death, initially self-describing TEMPLE NIGHTSIDE as “Ritualistic Death Metal Necromancy.” And indeed, that was the root – and result – of the then-duo's massive debut album, Condemnation, in 2013. But with last year's coveted split LP with comrades Vassafor – released to critical acclaimed by IRON BONEHEAD, and the lineup now expanded to a trio – the sound of TEMPLE NIGHTSIDE subtly began to morph into more atmospheric and more deeply cavernous shapes. Alas, with TEMPLE NIGHTSIDE's lineup now a functioning a quartet, those shapes have arisen in the form of The Hecatomb. Ever so aptly titled, The Hecatomb is lumbering, lurking menace and miasmic dread dragged to the Beyond and back. It's tangibly still death metal in nature, but there's a certain sinister sensation that eludes conventionally metallic definition; its hulking plod gives way to bestial pulse and then evaporates into a smokestack-dense fog of frightening, palpable evil. The manner in which these nine tracks – three of which are concertedly dark-ambient “Commune” soundscapes – burst forth and then billow away suggest ritualistic disintegration…or more accurately, transcendence. “A slow descent into Hell” is an oft-misused/abused appellation for sepulchral death metal, but it truly is done justice here. Abyssal sound devoted to and driven by death worship: TEMPLE NIGHTSIDE's The Hecatomb shall stand as a new golden pillar of fathomless morbidity.